If you setup a virtual machine with Windows Server 2003 Standard, Windows Server 2003 Enterprise or Windows Server 2003 Datacenter and you are missing your network then this happens because you have to install Windows Server 2003 Service Pack 2. 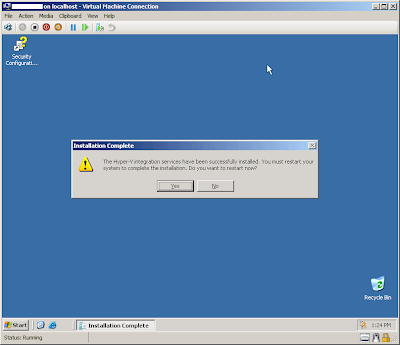 Without the Service Pack 2 of Windows Server 2003 the instance within Hyper-V will NOT recognize your network. First you have to install Service Pack 2 and second you will have to install Hyper-V integration components. 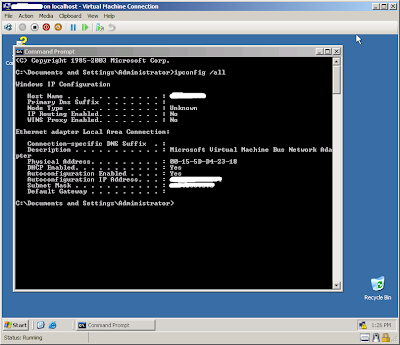 Due this your virtual machines guest have access to Microsoft VMBus Network Adapter. Note: prepare yourself with a CD you can burn since you cannot map any USB stick to Hyper-V.